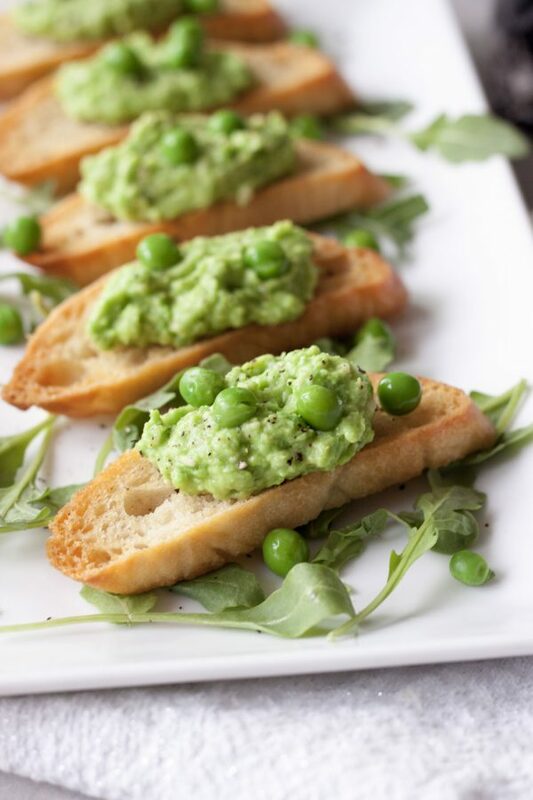 Toast, toast, toast or if we’re having people over crostini, in this case Crostini with Fresh Pea Pesto! If you follow me on Instagram or even if you’re a regular reader you know we are all about bread, more specifically homemade sourdough bread, since just before Christmas. It’s been on repeat since a week or so before Christmas and at first it was just me getting as much as I could because my tummy was handling it so well and I hadn’t had real bread in so long. Well after a few months I wasn’t seeing it stopping soon. That said when summer came we are all about simple and with that toast for dinner became a thing. Yes really. Bruschetta, so toasted sourdough with fresh tomatoes, basil, onions, ect. Now it’s topping toast with what we have coming out of our garden. 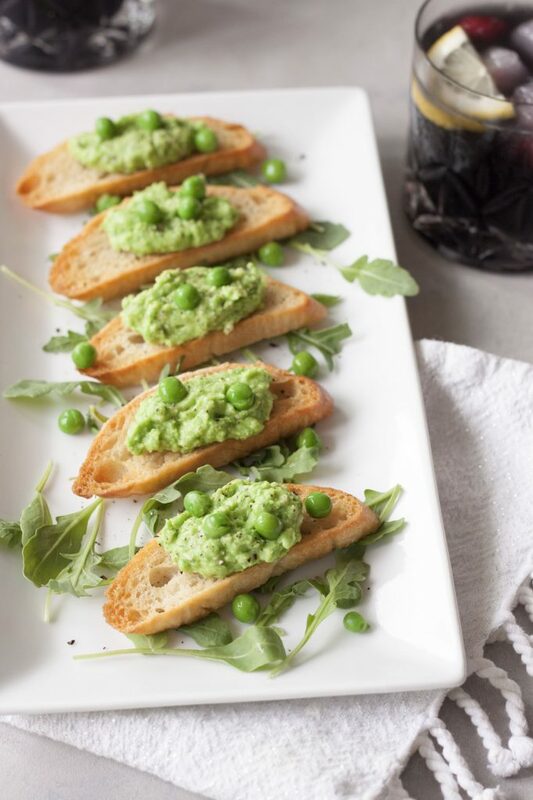 So Pea Toast, which doesn’t sound very fancy so we’ll go with Crostini with Fresh Pea Pesto, became a thing. Quick and easy dinner with a salad, or just as is with wine for an easy Friday night dinner while watching a movie when we decide to switch up sushi night. For the girls is kombucha or lemonade not wine, obviously. 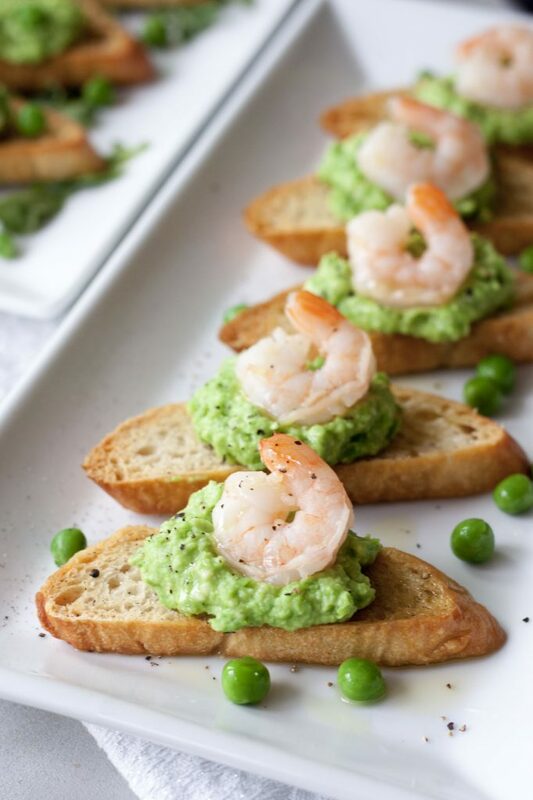 It’s also perfect for having friends over making a quick and easy appetizer. So quick and easy it’s almost too easy to post but keeping it real I thought it had to be shared. Especially after going out for dinner before seeing Bruno Mars a few weeks ago and having “Crostini with Fresh Pea Pesto and Shrimp” not sure what it was called but I remember it had truffle oil and instantly I thought about that bottle of white truffle oil I had up in the cupboard and how I needed to go home and try it with that. Of course I did, then I had to make it again to photograph and not only was lightly a pain I was starving and I went to grab the micro greens and they weren’t there so instead of holding out to photograph again I’m sharing it because it doesn’t always have to be pretty, it isn’t always pretty, and peas are in season. We’ll have to grab our from the local farmer’s market or buy frozen as a little critter, ok not so little, has been climbing into our garden beds and devoured the peas, beans, carrots, and sweet potatoes! I think it’s finally left as things are growing back and the camera we put out there isn’t showing anything, fingers crossed. I know one of the first messages I’ll get is for the sourdough recipe. I posted our Sourdough Boules and it’s the same recipe and process, using a double rise, but making it into French loaves or baguettes. I hope to get more bread recipes up soon but the biggest thing is that based on where you live it usually takes some tweaking as even if we were to make a sourdough off a recipe in our environment usually it requires less water making it here. Making it here in Minnesota isn’t going to be the exact same as making it in California, New York, Colorado, ect. It is a little trial and error but once you know what works you won’t stop. We still tweak and play trying to make it better, crispier crust, fluffier lighter bread, it’s a never ending process. A fun process at that. Making it vegetarian, vegan, or serving it with shrimp it’s delicious! Make it fancy or simple it just works, like that simple black dress! 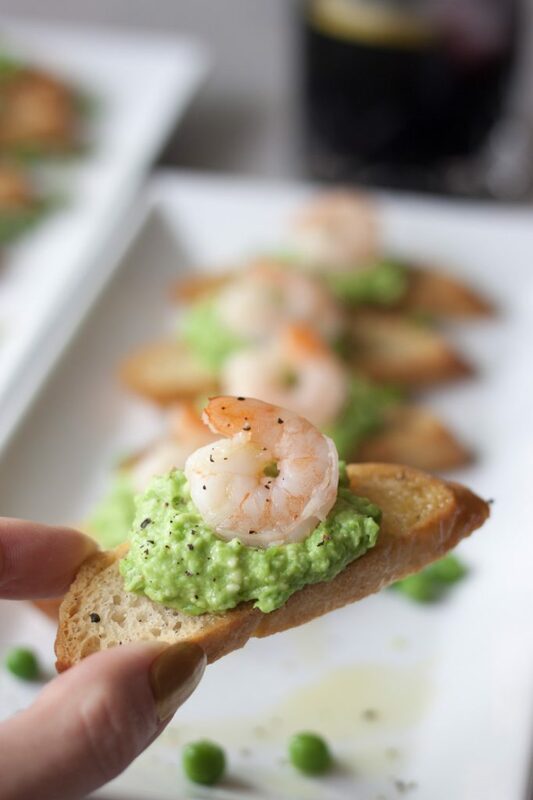 Quick, easy, fresh, and delicious this Crostini with Fresh Pea Pesto is great for a simple dinner or perfect appetizer for your next get together! Top it with shrimp and white truffle oil or keep it simple and still delicious with out for a vegetarian and vegan version. Preheat oven to 400F. Slice bread about 3/8" thick and lay in a single layer on baking sheets. Brush, or spray, bread lightly with olive oil. Bake bread for about 15 minutes until toasted and golden brown. In a food processor, I use my mini one, pulse peas. Grate in a clove of garlic, add parmesan, and add 1/4 cup of olive oil until almost smooth. Season with sea salt and pepper to taste. If serving with shrimp and you want it warm heat it in a skillet or as desired. Once bread is toasted remove from the oven. If desired cut the top off the additional clove of garlic and rub on toast. 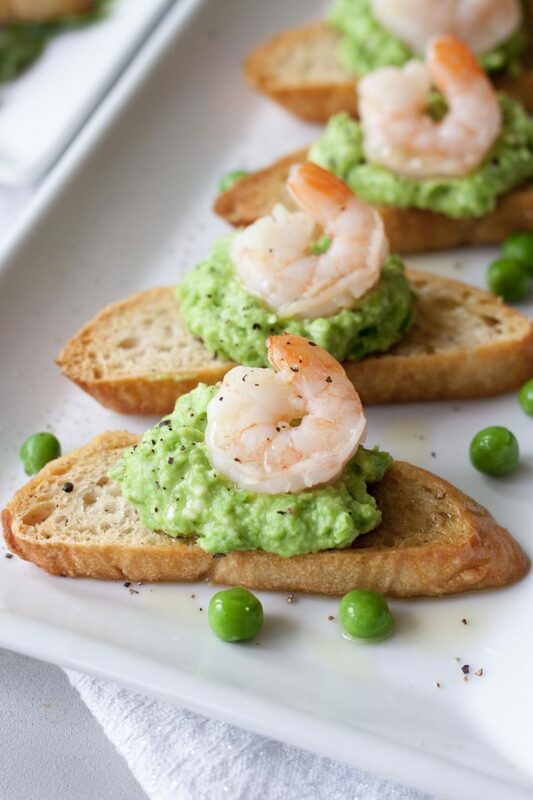 Top each toast with a spoonful of pea pesto, garnish with fresh peas, fresh ground pepper, greens, shrimp, or as desired. If adding shrimp I like to add fresh ground pepper and after plating drizzle with white truffle oil. I love that you made pesto from peas! Looks super simple and scrumptious. I’m obsessed with your sourdough! I have just made my third batch using my natural starter and no yeast. It’s true about playing with the recipe. I am currently experimenting with different combinations of whole and white flour. We are currently enjoying lots of avocado toast or just recently topping the bread with cottage cheese and plum spread – yum! What a stunningly fresh crostini! You really know how to jazz up greens Sarah. This looks great! I’m sure it would be fantastic on a gluten free baguette!